The secret to consumer loyalty is ‘Relationship Banking’ and the mantra is ‘Serve first, Sell later’. ‘Platform customization‘ service is an effective way to attract and maintain more customers, as long as the costs associated can be controlled effectively. Designing the tailored solution that is ‘just right’ for the client gives them the proud feeling of ‘owning it’ rather than ‘using it’. With transactions, synonym to self-service, are increasingly moving online, the little remains of the customer service must be made even better. In this digital age, the brand and customer touch-points are the key selling points. Technology is increasingly changing consumers’ needs and expectations. Usually, e-commerce platforms are built around the idea that ‘one size fits all’. While this works for small businesses, anyone who is looking for ‘an out of the box’ solution should be looking out for ‘an out of the box’ platform too. So customization should be at the core of a flexible e-commerce platform that is ready to cater to the diverse business needs of ‘one and all’. Since there has been a drastic increase in digital payments and transactions post demonetization, many new users from both urban and semi-rural areas are adopting digital transactions. According to a white paper by ACI Worldwide along with AGS Transact Technologies (AGSTTL), the user base for digital transactions in India is currently close to 90 million with a projection of 300 million by 2020. This creates a constant demand for more and more reliable, holistic and scalable technology for digital payment platforms. Why is Customization of the FinTech Banking Platform Needed? While a lot of banking organizations have started re-shaping their payment systems and processes as per the users’ needs and payment behavior, many find mass penetration extremely challenging. The only solution is to build it customized and flexible to accommodate the growing demands of innovation and scalability. The service providers/ aggregators must be able to offer the bank and its client maximum return and full control over the financial architecture. This can only happen by means of a better understanding of the business policies and regulatory parameters. This would also bring all types of banking transactions onto one user-friendly platform which is secure and compliant with all regulations. It also provides many value-added services like payment of utility bills and recharges for its customers at one place. Cutting operational costs by means of virtual and branchless transactions. Connect with a larger customer base and providing them with holistic banking experience virtually. Bypass the existing international payments network and thus resulting in more savings to both customers and the banks. Simplified procedures to save, secure and automatically share database across all the branches. Seamless transactions which give total control to the customers without the need for a bridge between the end-user and the banks. Improved saving and investment structure with minimal settlement time and cost. Needs vary from one person to other, and there is no ‘one size fits all’ rule. There are many things that you can achieve via customization of the platform that you won’t get in the general banking solutions. The main reason behind the necessity of customization is to be able to provide you with all the required features based on your needs and requirements. B2B (agents/super agents), B2C (direct consumers) aspects need to take care of with a similar transaction flow. The solution should support all the interfaces such as Web, Mobile, USSD, SMS. It should have the capability to process online transactions as well as offline ((Especially in case of loans/insurance/tax/school fee collections, Pin based vouchers etc). It should be integrated with inbuilt business intelligence, analytics, and reporting modules with a real-time view for transaction monitoring purposes. Standard API should be used for other consumption networks to ride on the aggregated services. The solution should have the flexibility to integrate over multi-protocols viz. SOAP, ISO8583, HTTPS, file-based, Rest API, MT103, and MT104 etc. Multi-level authentication on the transaction (OTP/password/biometric) and encryption levels RSA2048, AES, SHA Hash etc should be supported. All business configurations like user roles, Access controls, commissions, discounts, products, services, accounting/reports, GLs and many more depending upon the customer’s requirements should be possible via the admin interface. Supports In-built customer support interfaces to record each customer query and resolutions. Also supports In-built auto-reconciliation feature for system transactions settlement with the 3rd party services providers. Should support system/transactions real-time monitoring with alarms configurations and different severity levels. The solution should have the capability to operate over cloud infra, the hybrid model or on-premise deployment. How are organizations getting benefitted from platform customization? With mobile technology becoming a huge facilitator to reach semi-urban and rural masses, connecting them with mobile banking would enable them to simplify the transactions. It will also facilitate digital transactions even from the unbanked segments of our economy promoting last-mile banking. Total control over financial management by monitoring dial-ups and directly attached devices. Bringing down the total ownership cost. Easy addition of POS device terminals with minimal or no downtime. Improve efficiency of operation through speeding time-to-market and increase revenue on a per-transaction basis. Make the payments more secure, reliable and simplified. Easy addition, edition and deletion of terminals and creating an omnichannel based transaction system. Gain a competitive edge by the ability to offer multi-currency dispensing and other value-added card features. Processing online as well as offline payment on a high-technology driven platform. 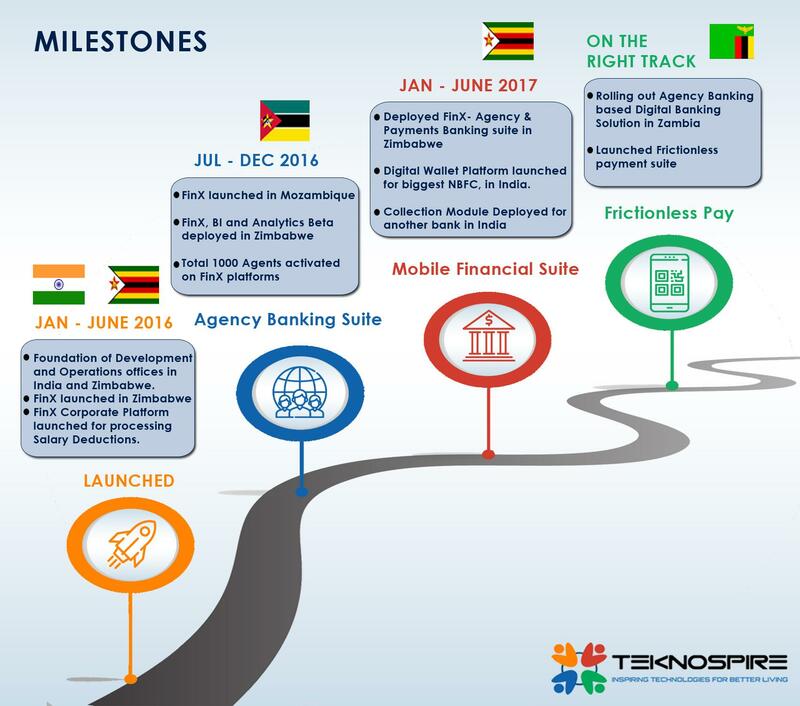 Looking back, we at Teknospire, started our journey in 2015. Our flagship product “FinX” helps financial institutions to bring FinTech driven banking solution for the last mile. Its a complete package with well-integrated above-mentioned specifications and much more, and offers a secure and seamless banking experience. For more information please visit our website. Our FinX Agency Banking Suite enables a bank or financial institution to cost-effectively extend its branch network through the use of appointed and authorized banking agents. Another feather in our cap, FinX Mobile Banking Suite enables convenience to the customer in establishing an electronic account that can be used in carrying out the broad range of financial transactions. 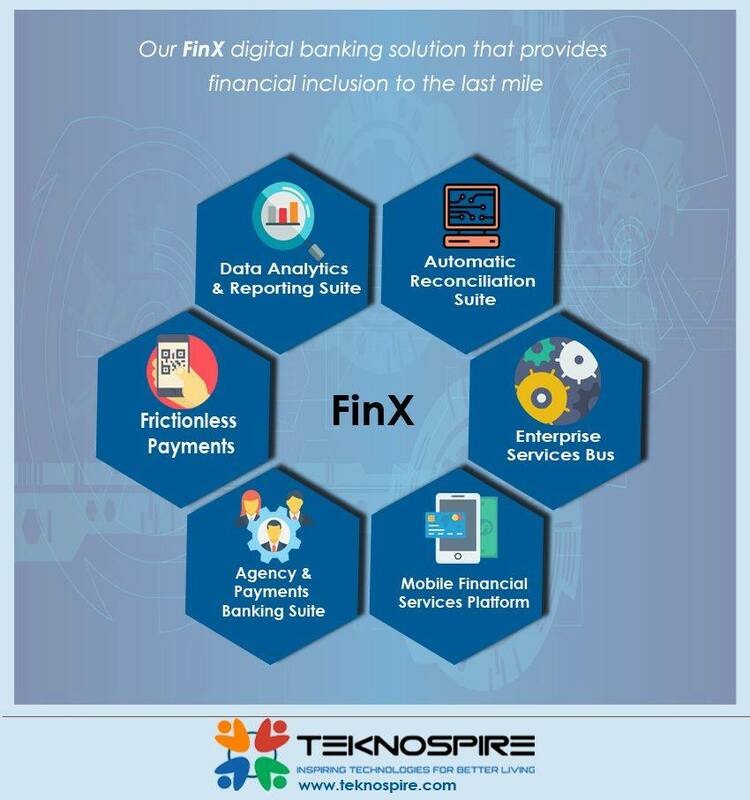 Teknospire’s FinX Payment switch aggregates all value-added services and a lot more. It can be integrated with any banking solution, agency banking solution or the corporate banking solution to draw more footfall to the financial institutions and grow the digital transaction base. “Technology by itself is not the disruptor. Payment switches offer high levels of flexibility and scalability. They are also to be included, coupled with huge scope for built-in analytics and reporting modules to all banking and non-banking organizations. However, businesses still have a long journey ahead of them in terms of understanding and integrating it into their current payment gateways. What needs to be understood is that such customizations are a pivotal part of growth and cannot be ignored.